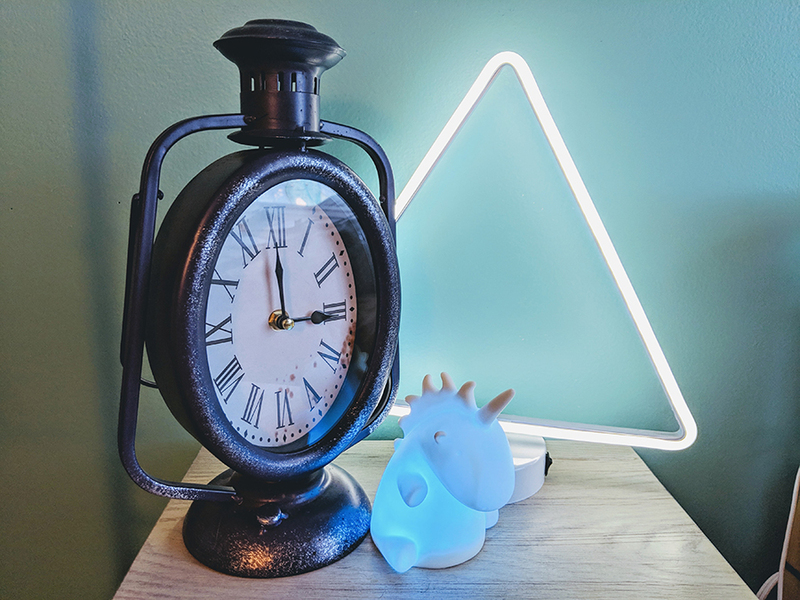 I like to keep a very loud analog clock and a color-changing unicorn in my room to help supply background stimulus so I can stay focused on things I actually need to do. First things first: I am an extrovert. My mind thrives on other people and their energy. When I was a baby, my parents used to play sounds of a noisy kitchen during rush hour or highway traffic just to help me fall asleep because without background stimuli, nothing will ever get done. When I choose where I sit in a class, 90% of the time I will choose the seat in the middle of the loudest, most rambunctious, and distracting people in the room so that I can stay focused. Yes, it does sound counter-intuitive, but it works for me. See, my mind has to always be engaged with something, no matter what I am doing. I have to have a constant state of stimuli that my brain has to be processing so that I can be productive. When there’s a constant murmur of various conversations going on, my brain is focusing on not getting distracted, which creates the constant background stimulus. Since my brain is already working on something, I can continue what I was doing. When there’s a lull in my focus or I get bored with my current task, my brain has to work harder on not letting me get distracted, which keeps up the level of stimuli, so I can easily just jump right back into what I was doing. The problem is when I am alone or I’m in a dead silent classroom. My brain doesn’t have anything to keep from distracting me, so when the task at hand becomes boring, well let’s just say there’s no hope after that. Instead of just jumping right back into what I’m supposed to be doing, my brain tries to find something interesting to keep itself entertained, but distracts me in the process. And there’s when I start off bored, because then there’s just a back and forth battle of my brain trying to find something to do in the background, me trying to focus on the thing I actually need to do, and the endless possibilities of things I could be doing instead. It gets bad. And if I start my day out bored and have no one imposing things I must do at certain times in my day, I will have wasted that day before I even get out of bed. Boredom doesn’t free up my time for me to catch up on my never-ending to-do list, but rather it’s a bottomless hole that renders my motivation and will to focus completely and utterly useless. Boredom is something can and should be used as a motivator. It can make you try new things, cause you to get things done, and not sit around being lazy. When I get bored I am compelled to do something, whether it is writing, reading, cooking, or just cleaning. I can’t just sit around on the couch or in my bed and do nothing. Even if I have completed everything and there is nothing left, I still won’t take a break because my mind is already at this high working point and doesn’t want to stop. I always have to keep myself busy in some kind of way. In my mind, when I am not doing anything it makes me feel as though I am useless and my actions are meaningless. I have to take action in order to fill that emptiness. When some people get bored they tend to watch TV to get out of their state of boredom, but if I’m bored, that means I am bored of watching TV, too. So to get out of this state, I start with organizing my bookshelf, which has already been done twenty times before. The next thing I know, I’m doing the dishes while there are cupcakes in the oven and writing a story on my computer that is most likely three-fourths of the way finished. I get bored of not having anything to do also, and then I am back to where I started, laying down and feeling useless. I have to actually do something, whether it is mentally or physically. My mind never seems to rest completely when I am bored. I think about all the things I could be doing, and my mind still continues to think about different topics and ideas, which sometimes leads to some of my best writing pieces. People complain about being bored and having nothing to do when in actuality there is probably still a lot of work. For example, there is always time to study for that test or exam that’s coming up. And many times when nothing that needed to be done gets done, the day is wasted being bored. I’m glad that I can use my boredom for good and not procrastinate getting stuff done. Being bored does not necessarily mean you have to waste your time doing nothing instead it can become a time to try new things, reflect on different topics, and just be productive overall.